UK Independence Party leader Nigel Farage said Monday that Russian President Vladimir Putin behaved “in a more statesman-like manner” throughout the so-called Brexit referendum campaign than US President Barack Obama. The UK shocked the world last week when it voted to leave the European Union. Obama had previously warned during an April trip to the UK that if it chose to do so, it could fall “to the back of queue” when negotiating trade deals with the US. 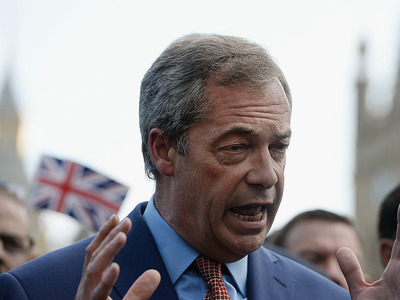 Farage, who some have suggested could be the next UK prime minister, told “Your World With Neil Cavuto” guest-host Trish Regan that Putin dealt with the situation in a better way. “Vladimir Putin maintained his silence throughout the whole campaign. I’m not a fan of Vladimir Putin, but you know the Ukrainian crisis actually was smart for the EU saying they wanted to extend their borders to take in the Ukraine which Putin took as being a direct threat,” he said. Following the vote, Obama released a statement of support for the UK. “The people of the United Kingdom have spoken, and we respect their decision,” Obama said.